I was contacted recently by one of the Windows Insider MVP Program Managers asking to set up a telephone interview. The results of the interview were published today. For those who haven't heard about the Windows Insider MVP Program, it was initiated following the reorganization of the Microsoft MVP Program in October, 2016. As a result of the changes, Xbox MVPs moved under the management of the XBox team and the consumer MVPs moved to the Windows Insider Program. The initial Windows Insider MVPs comprised the former Consumer Security, Surface, Windows Experience and Windows Phone MVPs. Special thanks to the Windows Insider MVP Program Managers, Tyler Ahn and Joe Camp, for all their hard work and to Dona Sarkar and the Windows Insider Program for their willingness to take us on. 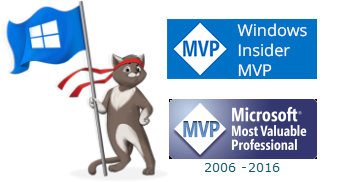 Following the January, 2017, award cycle, there are approximately 200 Windows Insider MVPs (#WIMVP). Although there isn't an official website yet, fellow MVP, Barb Bowman, created an unofficial list of the WIMVPs who provided her with information. The list can be found in the references below. The delay of the Microsoft February security updates to the March Update Tuesday (March 14, 2017) resulted in those operating systems having the built in Flash Player not getting the latest security update. Rather than hold the Flash Player update to March, Version 24.0.0.221 of Adobe Flash Player has been released for Windows Server 2012, Windows 8.1, Windows Server 2012 R2, Windows RT 8.1 and Windows 10. Pale Moon has been updated to Version 27.1.1. Windows: Solved stability issues caused by the release build process, resulting in unexpected behavior (e.g. hangups). After considering all options, we made the decision to delay this month’s updates. We apologize for any inconvenience caused by this change to the existing plan." "UPDATE: 2/15/17: We will deliver updates as part of the planned March Update Tuesday, March 14, 2017. " Adobe has released Version 24.0.0.221 of Adobe Flash Player for Microsoft Windows, Macintosh, Chrome and Linux. Important Note: Downloading the update from the Adobe Flash Player Download Center link includes a pre-checked option to install unnecessary extras, such as McAfee Scan Plus or Google Drive. If you use the download center, uncheck any unnecessary extras that you do not want. They are not needed for the Flash Player update.